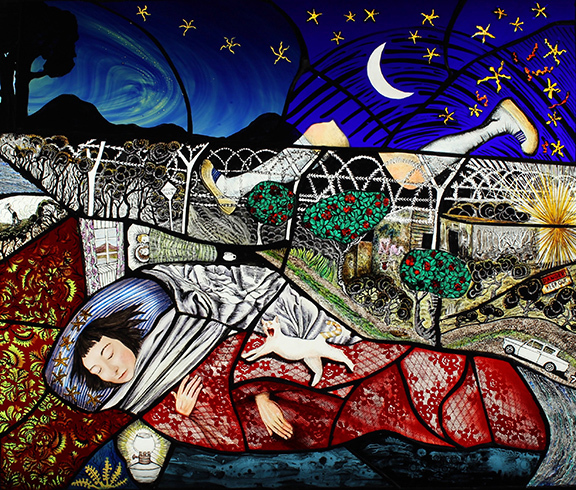 Pinkie Maclure 'Self-Portrait Dreaming of Portavadie' 2019 Stained glass. Pinkie Maclure grew up in a fishing village in Northeast Scotland, spending every night drawing pictures of imaginary people. At the age of 14 her family split up and her life became lonely and chaotic. She was nicknamed 'the misfit' by teachers at her new school and the art teacher, a sexist bully, made fun of her drawings. She gave up art completely and became increasingly alienated, travelled alone to Paris and then London, moving from squat to squat while trying to express herself through performance and music. Over the next 25 years she recorded ten albums, but remains largely unheard. 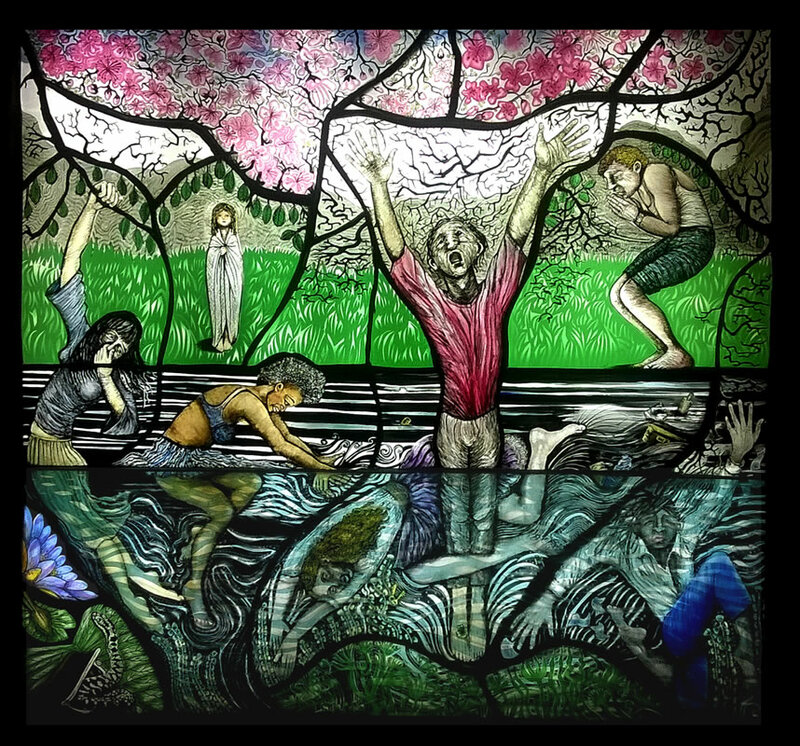 She only took art up again in her forties, when, after many years of unemployment, she fell into a job making and mending domestic stained glass windows. 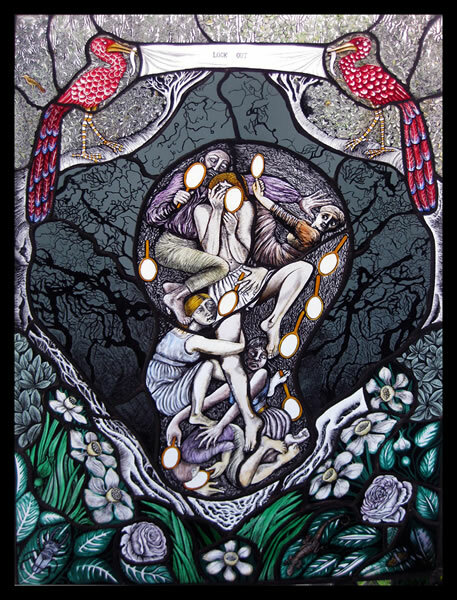 Frustrated by the meaningless modern designs in 20th century architecture, she grew fascinated with the mysterious allegories of early church stained glass and taught herself to paint and fire coloured glass. Eventually, she bought a sandblaster and began to work with hand blown 'flashed'* glass, where a layer of clear glass is coated with a layer of coloured glass, which can then be removed by the artist using a sandblaster, drill or acid, allowing more artistic freedom. In 2011, she was chosen to design and make a panel ‘The Family’, for Edinburgh's new Sexual Health Clinic. This led to her being shortlisted for two art awards, (Jerwood Makers and Fergusson Art Award). She began to make more complex, personal pieces, discovering that the slow, laborious process of making over many weeks allows her mind to drift; ideas emerge unexpectedly and can be dropped in, like a collage of thoughts. Her current work uses painting, engraving, sandblasting, glass beads, diamond filing and layering. Her work links past and present, through dark personal memories, references from medieval and Renaissance art and daily observations of people frantically struggling to compete with each other, oblivious to the fragile beauty of the natural world and their bloodlines to the past. 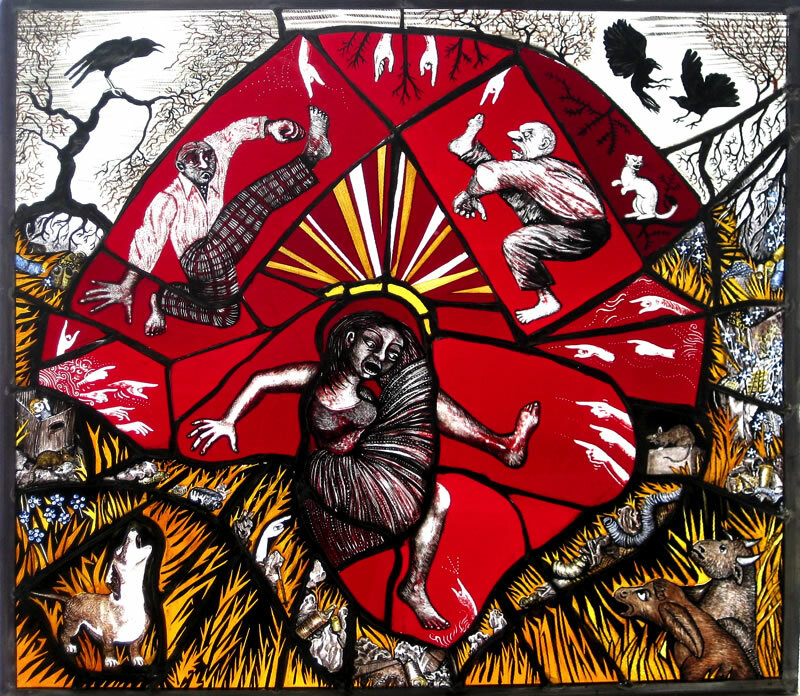 She draws inspiration from early stained glass, as well as collage, decorative and comic art, early Flemish art, Paula Rego, Margaret Macdonald Mackintosh, Pina Bausch and the Scottish environment. 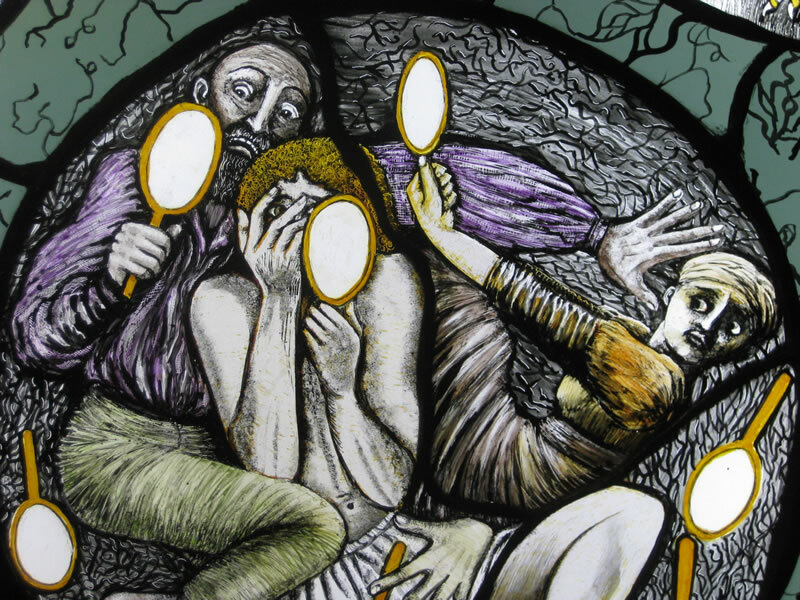 She creates work that is as complex and intriguing as medieval glass, but also speaks about 21st century identity, history, environmental alienation, sexual politics, capitalism, religion and many controversial subjects which resonate today. Pinkie's work can be architectural (bespoke for a window or other aperture) or displayed in a light box. "I think it is technically and aesthetically very sophisticated and fresh, certainly some of the nicest contemporary stained glass I have seen. I particularly like her sense of composition and use of the lead lines. "